heinnews – Could young Indian Harsh get Stellazzurra an ANGT wild card? Could young Indian Harsh get Stellazzurra an ANGT wild card? The Turkish Airlines Euroleague is always looking to expand and open itself to new markets. 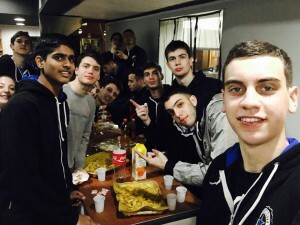 Well, Stellazzurra Basketball Academy Rome might have the ultimate golden key – and all it would cost them is a wild card for the Adidas Next Generation Tournament Finals in Berlin. Alright, let’s do just a bit of math for a second. Stick with me. India right now has a population of 1.305 billion people according to http://countrymeters.info. Think about the fact that just one-tenth of 1 percent of that number is 1.305 million. Now imagine that just one-tenth of 1 percent of the people in India are interested in seeing how their prized young basketball talent is doing in far-off Europe. That my friends is the golden key – and Stellazzurra have it in Harshwardhan Tomar. The 2.04m forward just celebrated his 15th birthday during his three-month tryout with the Italian academy. “Harsh” – as he’s known for short – joined Stellazzurra in late December and the academy is fully committed to him. “It’s a tryout for him, not for us because we want him. We know him as a player. He’s a big athlete. He can run very fast. He’s 2.04m and he can become a small forward in three years. He’s a good player but he needs to learn to live in Italy,” Giacomo Rossi, Stellazzurra’s sports director and chief recruiter, told the Taking The Charge podcast. Rossi and his Stellazzurra staff found Harsh at the 2015 FIBA Asia U16 Championship, where he was playing as a 14-year-old and averaged 5.0 points, 5.2 rebounds and 1.3 blocks despite being two years younger than most of the other players. He collected 11 points and 5 rebounds against China and 6 points, 8 rebounds, 4 blocks and 2 steals against Hong Kong. The Italians eventually got in contact with Tomar through the Indian Basketball Federation after convincing them they wanted to give the youngster – the country’s number one player at the youth levels – not only a high level of basketball training but also an international school education. “This is the first move for us in Asia,” said Rossi, whose U18 academy has had players from 15 different countries in the past two seasons. Rossi has assigned Mauro Matteo as Stellazzurra’s Operations Manager for Asia – with the next goal of landing a player from China. “We want one guy from China to open our market. When we saw the Chinese national team at the youth tournament they were amazing – strong bodies, super basketball players. I don’t know why nobody in Europe doesn’t bring in somebody from China or Korea. There are worse players in the Euroleague,” said Rossi. Which brings us back to the Euroleague and the ANGT. A few years back, the Euroleague was eager to expand into China and awarded a wild card to the Chinese U18 national team for the ANGT/Nike International Junior Tournament for three seasons – 2010-11, 2011-12 and 2012-13 before picking Team Brazil for the 2013-14 ANGT Finals. Rossi said his club would love to get a wild card for the ANGT Finals in Berlin in May, especially after making their debut at the competition’s highlight last season by winning the ANGT Rome qualifying tournament. Rossi would like his players to have a chance to learn from the experience at the 2015 ANGT Finals in Madrid, where they lost all three games against Real Madrid, VEF Riga and INSEP by at least 30 points. “Last season we went to Madrid and the other teams destroyed us. We need to know and understand why we lost. This was the first step for us to improve,” Rossi said. Rossi admits that he doesn’t expect Stellazzurra to get a wild card for Berlin. Armed with the possibility of drawing interest in the ANGT from millions of people from India, Rossi and Stellazzurra might have a pretty good argument.